By Sean Jones: Saul Canelo Alvarez vs. Danny Jacobs is a 50-50 fight due to the 10 pound rehydration clause in the contract, according to trainer Virgil Hunter. He believes that the bigger, stronger and older fighter 31-year-old Jacobs (35-2, 29 KOs) will be impacted negatively more so than the 28-year-old Canelo from the 10 pound rehydration limit that Golden Boy Promotions put in the contract. The rehydration clause in effect give Canelo a handicap in the fight, which is kind of strange that he would need one. Canelo is supposed to be the WBA/WBC middleweight champion, and he’s a full fledged 160 lb fighter at this point. This isn’t a situation where Canelo is fighting a super middleweight that he needs a rehydration clause. 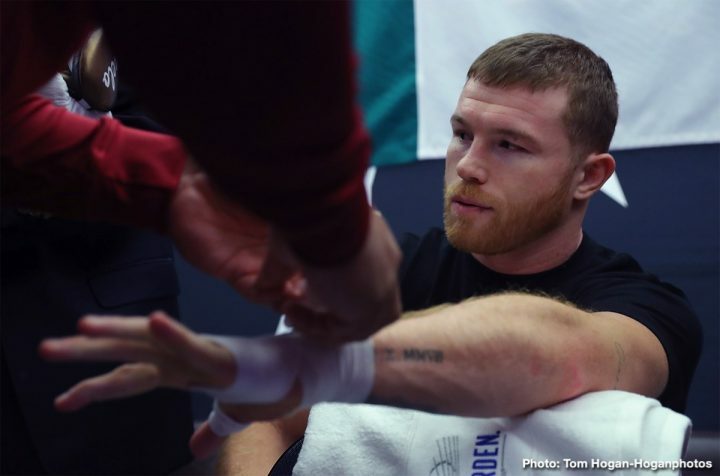 Adding the clause in the contract suggests that Canelo – or his promoters at Golden Boy Promotions – feel that they a handicap in order to beat Jacobs. On the surface, it doesn’t look very heroic for a fighter that supposedly is the best in the middleweight division needs a handicap against his opponent, who holds only one belt, the IBF strap, rather than two. The two fighters will need to weigh-in twice for the fight. The first weigh-in will take place on Friday, May 3, and then second on the morning of the fight on May 4 for their match on DAZN at the T-Mobile Arena in Las Vegas, Nevada. Their weight can’t be above 170 lbs for the secondary weigh-in without facing a large fine. “I think right now going into that fight, it’s a 50-50 fight,” trainer Virgil Hunter said to Fighthype about the Canelo vs. Jacobs fight on May 4. “The question is in training can Canelo provide the kind of sparring that will assist him in the Jacobs fight and vice a versa. So right now, I think it’s a 50-50 fight. I think it’s a fight that’s not going to go the distance,” Hunter said. What Hunter isn’t talking about is the venue for the fight. Canelo will be back at his favorite venue at the T-Mobile Arena in Las Vegas for the Jacobs fight, and a lot of boxing fans see that as a huge predicament for the ‘Miracle Man’ Daniel. To some, it means that Jacobs will need a knockout if he wants to win, because there’s always a chance the scoring will be similar to Canelo’s two fights with Gennady Golovkin at the T-Mobile. Those are fights where Canelo appeared to lose the first one in 2017, and then fight at least to a draw in the second one in 2018. Canelo was given a draw in the first fight with Triple G, and then a 12 round majority decision in the second one. The scoring seemed off in both fights, especially the first one where one judge had Canelo winning 10 rounds to 2 over GGG. “Isn’t there a weight clause in the fight? Hunter asked about the Canelo vs. Jacobs fight. “So right there that can effect Jacobs. A 10 lb [rehydration] limit, so they negated that [Jacobs’ weight advantage]. You figure it would effect Danny more than it would Canelo. So that makes it a 50-50 fight. Everything is even across the board,” Hunter said. Danny is the older guy than Canelo, which means it’s likely going to hurt him a lot more to deal with the second day rehydration limit of 10 lbs. We don’t know how much the second day weigh-in, and the venue of the fight will have an effect on the fight. If the judges score the Canelo-Jacobs fight like the judges scored the Canelo vs. Golovkin 1 fight in 2017, it’s going to be very difficult for Jacobs to win the fight by a decision. Jacobs obviously believes he can beat Canelo by a decision. He’s not a jaded fighter yet, but if he finds himself on the receiving end of a controversial decision like GGG did in his two fights with Alvarez, he’ll have a different outlook. If Jacobs is lucky, he’ll get a rematch against Canelo like Golovkin did, albeit likely at the same T-Mobile Arena as the first fight. It would be sad if the Canelo vs. Jacobs fight ends in a controversial decision or if Danny weight drained because of the rehyration clause. You hate to see a fight ruined by bad scoring or rehydration limits that have little purpose in being there in the first place. If Canelo was facing light heavyweight Dmitry Bivol, then yeah, it would make sense for him to have a rehydration limit, but not someone from the middleweight division like Jacobs. Jacobs’ promoter Eddie Hearn of Matchroom Boxing USA has put him in a situation where he might not be at his best. It would be interesting to know why Hearn agreed to the rehydration limit. Was that conditional for them to get the fight? If that was the only way Jacobs could get the fight with Canelo by giving him a handicap, then he had no choice, but it might have been better for Jacobs to walk at that point and stand on his principals. The negative thing about the rehydration clause is it’s going to give Jacobs an excuse to tell the boxing world should he lose the fight to Canelo. Instead of Jacobs saying he was beaten by the better man afterwards, he might admit that the second day weigh-in limit got the better of him, which why there shouldn’t be one. The old school fighters like Joe Louis, Rocky Marciano and Muhammad Ali didn’t rely on second day rehydration limitations in order to win their fights against guys that they weren’t comfortable with fighting. You could you imagine Ali insisting that George Foreman agree to a rehyration clause for their ‘Rumble in the Jungle in Zaire? It would look really bad. That’s the problem you get when there’s an imbalance in popularity between the A-side and B-side fighters. You get the A-side guy tilting the playing field in his favor in order for him make sure he wins the fight. Not only is the Canelo vs. Jacobs fight taking place at the T-Mobile Arena in Las Vegas, where Alvarez was recently involved in back to back controversial fights at that venue, but now there’s also a rehydration clause that will further increase the Golden Boy’s star’s chances of getting the victory. If this was baseball, this would be like a popular team having the right field fence brought in 30 feet in order to make it easier for their left-handed hitters to hit home runs. The A-side fighters in boxing can game the system to negotiate a situation where they have so many factors in their favor that it’s very difficult for their B-side opponents to win. Jacobs can still win the fight, but it’s not going to be easy given the venue and the rehyration clause.